If you can’t make it to Broadway to see the latest star-studded version of Lorraine Hansberry’s classic American drama A Raisin in the Sun, you’ll probably do just as well to head out to Orinda and catch California Shakespeare Theater’s season-opening production. Director Patricia McGregor’s production offers a superb cast and makes a case for Hansberry’s play to be in the pantheon of American dream plays alongside Miller, Williams and O’Neill. This is very specifically an African-American play from the late 1950s, but it’s also a timeless family drama about struggle, failure and redemption played out in a classic battle between taking (aka capitalism, money, material worth) and giving (aka love, compassion, family). A sense of place is vital to the success of Raisin. The Younger family lives in a cramped, decaying, roach-infested tenement on Chicago’s south side, and the hope that emerges in the play, thanks to a $10,000 insurance check, is that they can start over in a home of their own in a sunny suburb known as Clybourne Park. Set designer Dede M. Ayite tackles the challenge of turning the gorgeous expanse of valley on view at the Bruns Amphitheater into a dingy, oppressive slice of the inner city by blending the two. At the center of the stage is the Younger’s apartment, too small for its five inhabitants and too shabby for this family’s strong sense of pride. Surrounding the apartment walls is a grid of fire escapes and balconies, with lines of laundry flapping in the cool evening breeze. It’s surprisingly effective (with a tremendous assist from Gabe Maxson’s lights) and offers a subtle but constant reminder that there’s a better, brighter life waiting just outside. The extraordinary Margo Hall (fresh from her powerhouse turn in Marin Theatre Company’s Fences) is Lena Younger, the matriarch whose depths of compassion and love for her family are constantly surprising. She sees her family falling apart around her and takes drastic action by using her late husband’s insurance money to buy a house that will not only get them out of the grit and grime of Chicago but will also serve their future by giving them roots (albeit roots in a neighborhood with no other black families, but change has to begin somewhere). Hall’s performance has such depth and feeling that she anchors the entire production, and that anchor is especially helpful because Lena’s children are angry and explosive in different ways. Walter Lee (Marcus Henderson) is 35 and restless. His 11-year marriage to Ruth (a strong Ryan Nicole Peters) is strained because Walter’s focus is almost solely on money, or lack thereof. He wants, he needs, he yearns, but he can’t latch on to anything. His chauffeur job is a dead end, and he figures he could use his mother’s insurance check to invest in a liquor store to make a better way for his wife, 10-year-old son and mother and sister. Walter’s younger sister, Beneatha (Nemuna Ceesay) is a bright young woman on her way to medical school. Her unease has to do with limitations she feels as a woman and as a black woman wrestling with her heritage (she and Walter are the fifth generation of Youngers in this country, a family of slaves and sharecroppers). She rails against “assimilation” and yearns to know more about her African roots. 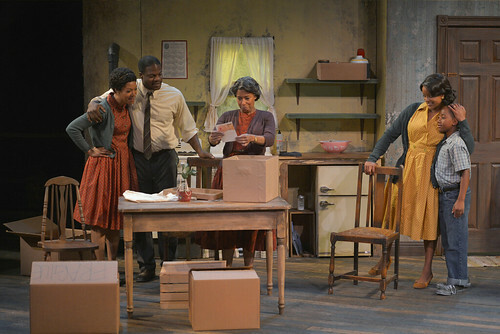 Hansberry’s Raisin has had two Broadway revivals in the last 10 years, with the most recent perhaps inspired by the success of Clybourne Park, a play by Bruce Norris that imagines what is happening in the suburbs as the Youngers prepare to move in and then jumps into present day to examine the state of the neighborhood. 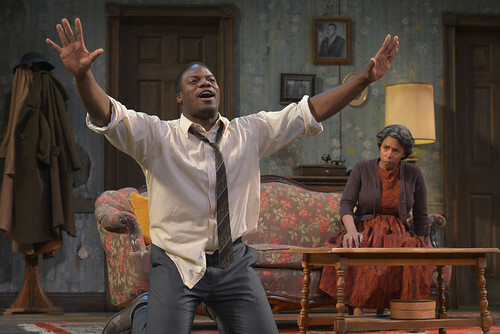 The only character in Norris’ play that actually appears in A Raisin in the Sun is Karl Lindner (played at Cal shakes by Liam Vincent), the Clybourne Park resident who basically tells the Youngers they’re not welcome and offers to buy them out (he also, horrifyingly, keeps calling them “you people”). It’s a fascinating bit of subtext, but what becomes clear in this fine Cal Shakes production – a wonderful way to kick off the 40th anniversary season – is that Hansberry’s A Raisin in the Sun is the real thing and everything else is a riff on her masterwork. Lorraine Hansberry’s A Raisin in the Sun continues through June 16 at California Shakespeare Theater’s Bruns Amphitheater, 100 California Shakespeare Theater Way, Orinda. Tickets are $20-$72. Call 510-548-9666 or visit www.calshakes.org.